The Intrigue of Emory Tate, Jr.
Emory Tate… the name is known throughout the world and evokes a number of different expressions from those who have either followed his career, seen one of his slashing victories, have witnessed one of his famed analysis sessions, or observed him from afar. What makes players around the world bestow upon him such praise? Why are chess players far and wide intrigued with this International Master? How does he slay so many Grandmasters so brutally? There is no straight answer. Part of the intrigue of the charismatic master is his enigmatic persona. While many of his games are known for their exciting flourishes, he guards the rest like precious secrets. At the same time, he provides one of the most fascinating spectacles when he gives an analysis of one of his games. While Tate prefers not to discuss his career in the Air Force, he is proud to mention that he is a 5-time Armed Forces Champion. Emory Tate is certainly an incredible chess talent, but he also is well-rounded in countless arts. His artistic acumen is expressed in his games and attracts many fans, far and wide. Photo by Daaim Shabazz. During an interview with The Chess Drum, he expressed his determination to get to the next level. He also stated in an interview with Jennifer Shahade that he is "finally going public." If this is indeed his intention, the Chicago-born, Indiana-bred master will finally get the honors that he so deserves. His play draws attention as if one is observing a work of art in progress. Despite his proclivity for brutality at the chess board, Tate generously gives of himself through analysis, simultaneous exhibitions and other types of gestures. To some, Tate may appear unapproachable, but if you've ever had a personal conversation with him, you come away feeling his intense love for chess. He is also an engaging conversationalist and will tell you exactly where he stands on issues. Very refreshing! At the World Open, Tate earned his 3rd norm for the International Master title and showed a few of his games to a crowd of gathered spectators. His trademark analysis is both incisive and entertaining. In today's age of databases, it is a rare sight to see any type of master give such an instructive display in an informal public setting. In addition, he will often stop by to watch non-master players conducting post-mortem and offer impromptu analysis. After looking at the position for a minute, he'll rattle off a deep sequence of moves (with variations) and find an obscure rook-lift or sacrifice… then he walks away leaving the players stunned. These days he appears more focused as seen by his stellar 7-2 result at the recently-ended U.S. Open. 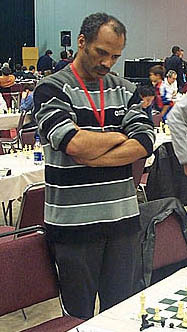 His only loss was to eventual winner, Yury Shulman. He has recently provided analysis of his loss to the late Aleksander Wojtkiewicz. That game will be featured in an upcoming issue of Chess Life. Tate is no doubt is looking for invitations to strong tournaments. Of course, pursuing the Grandmaster title is not without expenses, thus sponsorship is needed for this endeavor. Whatever is in store for this living legend, he has already contributed so much to the sport of chess… and there is more to come! 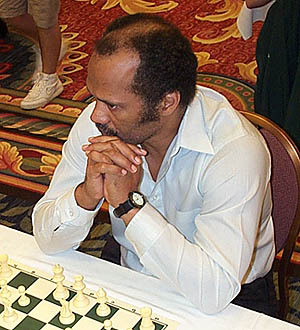 Emory Tate ponders move at Maurice Ashley's HB Global Chess Challenge in 2006. Photo by Daaim Shabazz.